Traditional medicine has used apple cider vinegar for centuries treating multiple ailments with its supposed benefits. Apple cider vinegar is made by cutting up apples, covering them with water and leaving them at room temperature until the natural sugars ferment and form ethanol. A bacterium then converts the alcohol into acetic acid the main component of Vinegar. The evidence that apple cider vinegar helps fight fat is weak; a short-term study in Japan added two daily drinks with 15 millilitres of apple cider vinegar diluted in 250 ml of water to the usual diet of overweight men and women. Their weight fell by about one kilogram over 12 weeks, but returned to usual levels within four weeks. It is not clear whether they had stopped drinking the solution at this stage. So whilst the jury is out on whether or not Apple Cider Vinegar can actually help you to 'lose weight', there is definite consensus that concludes apple cider vinegar helps to curb sugar cravings and subsequently control your food consumption. Taken daily; diluted with water it can help to kick-start your metabolism and discourage the growth of bad bacteria. Packed full of probiotics, apple cider vinegar can help to promote healthy gut function by replenishing the digestive system with good bacteria to support the body's natural processes. Cleansing and detoxifying, it can help to flush out build-up and get a sluggish gut moving again. This is also great for supporting immune health and giving your body a fighting chance against common colds. Apple Cider Vinegar can help to deter viruses by replenishing your immune system with a boost of good bacteria which work to ward off infection. Crohns results in a chronic inflammatory disorder, in which the body's immune system attacks the gastrointestinal tract. It is considered a possibility that the immune system s attack is directed at microbial antigens (an antigen is a molecule capable of inducing an immune response). While Crohn's is an immune-related disease, it does not appear to be an autoimmune disease in that the immune system is not being triggered by the body itself. The exact underlying immune problem is not clear; however, it may be that because these antigens are the focus of the immune system that this prevents your body from fighting other infections and diseases leaving the person more susceptible to illness. The research I have carried out has concluded that there are no medications or surgical procedures that can cure Crohn's disease. Treatment options are intended to help with symptoms, maintain remission, and prevent relapse. One in five people with the disease are admitted to hospital each year, and half of those with the disease will require surgery for the disease at some point over a ten-year period. While is used as little as possible, it is necessary to address some abscesses, certain bowel obstructions, and cancers. Crohn's disease affects about 3.2 per 1,000 people; rates have been increasing, particularly in the developing world, since the 1970s. Inflammatory bowel disease resulted in 47,400 deaths in 2015 and those with Crohn's disease have a slightly reduced life expectancy. It tends to start in the teens and twenties, although it can occur at any age. My daughter being nine years old is particularly young to have a chronic case. Males and females are equally affected. At the time of writing I have satisfied myself to not question the medical treatment my daughter has been administered; I have trust in the specialist she is under. What I am going to actively engage with her is about the diet, the intent is to start a food journey with her, it is evident that we need to consider her gut health; we need to look at whole foods. Minimise processed foods and ensure we give her body the best chance of absorbing the minerals and nutrients that will give her glow back. The search for the perfect Crohns diet was on the way. My daughter and I speak about food often, her relationship with has become strained, and this is probably due to us not understanding or knowing she had this condition. Her food choices are easy ones; she often eats frozen potatoes likely to be ‘gems’. Some meat but very few vegetables, fruit preferences were limited so we had to make a start. Initially she was placed on a nutritional shake diet for eight weeks so motivating her to eat whole foods was not difficult. My wife cooked quality meats cuts, lots of free range chicken and grass fed beef and real vegetables. Pack lunches were cold cuts, chickpeas and the like. We got off to a relatively good start. Getting Active; March saw the start of me really getting active and to be honest certainly by the end of the month it gave me a realise from the trials and tribulations associated with a parent trying to deal with a child whom is ill. I even had a run (plod) during her stay in hospital. A couple of notes; the target is the speed I would need to do the cycle leg of a triathlon to meet the average time competitors take to complete a full iron man. The difficulty factor represents the meters gained in altitude during the ride divided by 100. 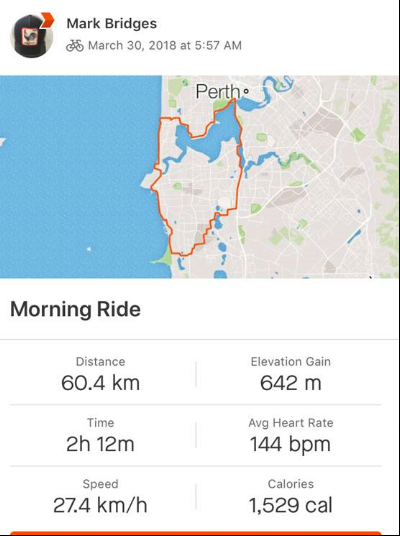 Strava is a social fitness network that I was put on to. It is used to my track cycling, running, and swimming activities using GPS data recorded via my apple watch. Activities are uploaded to the Strava site directly, via the Strava mobile application on my iPhone which is the sole reason I keep using Apple devices as the company appears to have disappeared up its own backside. I have bought the premium service so the software provides statistics such as distance, pace, speed and elevation, and provides comparisons with other users' activities. Strava also records heart rate and power data which I eventually will begin to use to analise how I am tracking. What it also does for me is making me accountable, by publishing my activities it motivates me to get out. The people on this journey with me are also Strava users and they interact with my postings. You also see theirs so the competitive beasts inside you drives to get out again. As I’ve progressed with this way of life people have become more interested in what I’m doing. I’ll always get them onto Strava. My wife very recently asked me whether I appreciated how many people I had started to motivate? I honestly didn’t, probably too self-obsessed but again got me motivated to continue this blog. A couple of notes; the target is the speed I would need to do the running leg of a triathlon to meet the average time competitors take to complete a full iron man. The difficulty factor represents the meters gained in altitude during the ride divided by 100. I really wanted to run 6-minute kilometers, and I was substantiating these plods on the road with three treadmill runs a week. I obviously needed to set the speed to 10 kM/h. At the end of the month I had increased the speed from 8 kM/hr to 9 kM/hr maybe 9.5 kM/hr which was fine but I was struggling to exceed a distance of 3 kM’s. Again I read the advice of seasoned runners who had posted on various internet sites, and a common theme was a Rhythmic breathing technique. There were variations on this theme but the easiest for me to master was breathe in for three steps and out for two. I initially practiced this walking the dog, then took it to the treadmill then finally to the road. As it became more natural for me on the treadmill the easier the 3 k's became and this technique certainly assisted with my performance and I was keen to take this to the road.